Head over to Discovery Green Park in Downtown Houston, which boasts multiple play areas for all ages and a busy calendar of special events throughout the year to keep the kids entertained with fresh activities for every season. The park operates year round with free regular activities and mostly free special events. The park is open daily from 6am to 11pm and different features and programs are offered at different times or seasons, so check their site for specifics. Part of Discovery Green’s mission is to be a “source of health and happiness” for Houstonians and the park meets that goal with the wealth of activities it provides for the city. In the heart of downtown, your family can visit this 12-acre urban green space and find a new activity at every visit. On the weekends when the weather is nice be sure to seek out the Art Carts for free rentals of fun park gear like hula hoops, bowling/juggling pins, a variety of sport balls, and Frisbees. They also loan shuffleboard equipment and golf putters for free so you can play on the putting green and courts. In the hot summer months, you’ll want to bring your swimsuit. The Mist Tree and Gateway Fountain provide lots of splashy fun for the littles. Kinder Lake is a fun place to learn to kayak (pictured above) or even pilot remote control boats. 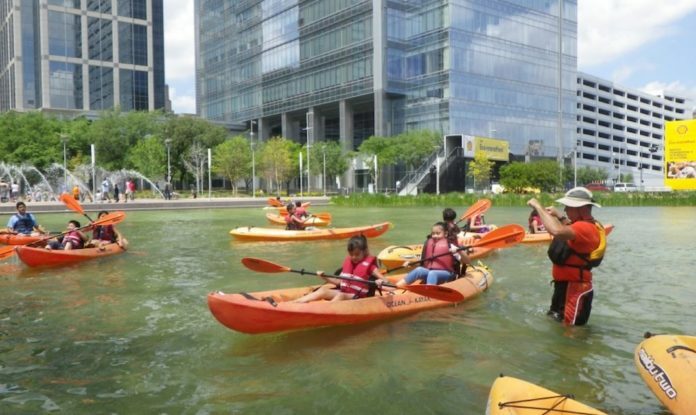 Those activities are some of the few that aren’t free at Discovery Green, so be sure to expect to pay for those or plan to skip them if you’re on a budget. In the winter months, this lake is morphs into a frozen ice sheet for ice skating. You can pack snacks and lunch or dinner for your visit, but leave any glass containers at home. You can also eat at The Lake House and watch the activity on Kinder Lake. If you are visiting for Flea by Night or the Farmer’s Market, try a new culinary experience from one of the food vendors. Discovery Green Houston is always hosting a new event, so be sure to check out their calendar so you won’t miss anything. Frequent events like yoga, live music, writing workshops, and recycling keep Houstonians coming back.